How much time do I need to contribute? We’re an all-volunteer movement (minus one staff person who helps coordinate all the local state groups) and we all have to juggle our involvement in 350 with our work, families, and other activities. We understand that your time commitment will change over time, too. Just because you have 10 hours of time to help out this month doesn’t mean you’ll have 10 next month. All we ask is that you be real with yourself about what you can do. What if there isn’t a local team in my town? 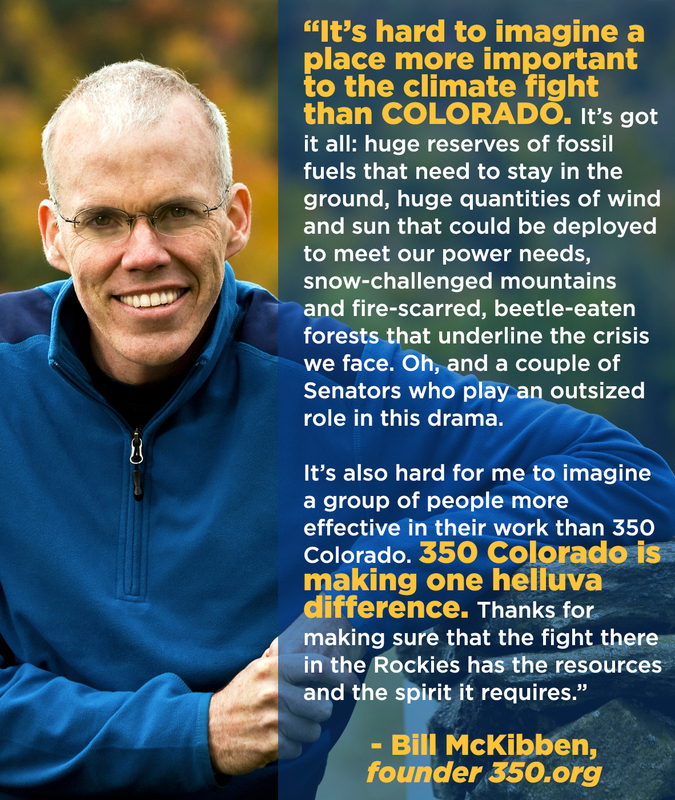 If you want to start a local 350 team in Colorado, go for it! You know your community better than anybody else and if you think there’s a need or desire for a local 350 group you’re probably right. Most of our groups act autonomously from 350 Colorado and from 350.org national. That means you can choose whatever leadership and group structure makes sense for your community. And of course, if you have questions or need a hand getting started, we’re always here to help. I thought fracking was good for the environment. What makes it so bad? To avoid climate catastrophe we need to be building the systems of the future now. There are many reports that lay out the truth about fracking: it’s bad for public health, it’s bad for our water system, it creates short-term jobs, it lowers property values, it causes earthquakes, and it contributes to global warming. And methane, the primary component of natural gas, is a much more potent greenhouse gas than CO2! The reality is that we need to be moving away from fossil fuels as rapidly as possible and that means leaving natural gas in the ground. I’m ready to divest my personal funds from fossil fuels. What now? Unfortunately most of us are turning a profit off of the destruction of our planet and we aren’t even aware of it. Understanding your piece in the fossil fuel market is the first step in divesting. This website http://gofossilfree.org/mymoney/ will help you move your money and build a better future for all of us. Do I have to get arrested to be involved? We do so much more than direct action. Most of our work involves outreach and education in our own communities, organizing events (like speakers, film screenings, potlucks, etc). You can always choose the capacity and amount of time you serve in the movement. We’re all volunteers here.